von Haehling et al. Eur J Heart Fail. 2010 May;12(5):484-91. Epub 2010 Mar 9. 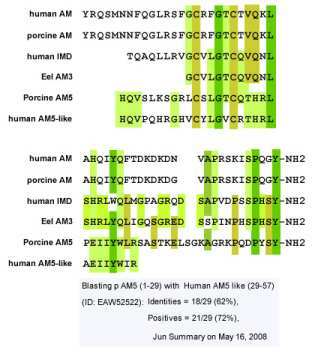 AIMS: Adrenomedullin (ADM) is a vasodilatory peptide. Its plasma levels or its precursors have not been evaluated in large populations of patients with chronic heart failure (CHF). We sought to explore mid-regional proADM (MR-proADM). METHODS AND RESULTS: We assessed MR-proADM in 501 CHF patients [age 63 +/- 11 years, New York Heart Association (NYHA) class I/II/III/IV 9/44/39/8%, median N-terminal pro-B-type natriuretic peptide (NT-proBNP) 878 pg/mL (interquartile range-IQR 348-2480 pg/mL), median left ventricular ejection fraction (LVEF) 31% (IQR 25-37%)]. Mid-regional pro-adrenomedullin levels (median 0.64 nmol/L, IQR 0.49-0.87 nmol/L) increased with NYHA class (P < 0.0001). During 1-year follow-up, 70 patients (14%) died. Increasing MR-proADM was a predictor of poor survival at 12 months (hazard ratio 1.82, 95% confidence interval 1.24-2.66, P = 0.002) after multivariable adjustment. In receiver-operating characteristic curve analysis of 12-month survival, the area under the curve for MR-proADM and NT-proBNP was similar (P = 0.3). Comparison of Cox proportional hazard models using the likelihood ratio chi(2) statistic showed that both NT-proBNP and MR-proADM added prognostic value to a base model of LVEF, age, creatinine, and NYHA class. Adding MR-proADM to the base model had stronger prognostic power than adding NT-proBNP (both P < 0.01). CONCLUSION: Mid-regional pro-adrenomedullin is an independent predictor of mortality in CHF patients, which adds prognostic information to NT-proBNP. Julian et al. Eur J Med Chem. 2005 Aug;40(8):737-50. 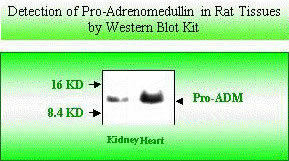 Adrenomedullin (AM) is a 52-amino acid peptide with a pluripotentialactivity. AM is expressed in many tissues throughout the body, and plays acritical role in several diseases such as cancer, diabetes, cardiovascular and renal disorders, among others. While AM is a protective agent against cardiovascular disorders, it behaves as a stimulating factor in other pathologies such as cancer and diabetes. Therefore, AM is a new and promising target for the development of molecules which, through their ability to regulate AM levels, could be used in the treatment of these pathologies. Levels of plasma total adrenomedullin are related with two acute phase inflammatory reactants (fibrinogen and sialic acid) but not with markers of endothelial dysfunction in Type 1 diabetes Adrenomedullin and vascular risk factors in Type 1 DM. Garcia-Unzueta et al. J Diabetes Complications. 2005 May-Jun;19(3):147-54. Adrenomedullin (AM), an ubiquitous regulatory peptide with different actions, is known to be elevated in different clinical situations, including diabetes mellitus (DM), but its potential role in the pathogenesis of diabetic vascular complications is not clear. In the present study, we examined plasma total AM levels, and their association with different markers of endothelial dysfunction and with other established risk factors for cardiovascular diseases, in patients with Type 1 DM. We studied a total of 155 patients, 117 patients without any kind of vascular complications, 24 patients with retinopathy only, and 14 patients with retinopathy and microalbuminuria but normal renal function. None of them had clinical evidence of atherosclerotic disease. Compared with the control group (64 healthy participants), patients had raised fibrinogen, soluble E-selectin ((s)E-selectin), vascular cellular adhesion molecule (VCAM), angiotensin converting enzyme (ACE), and von Willebrand factor (vWf) (P<.001 in all cases), but plasma total AM, endothelin (ET), sialic acid, and homocysteine were not raised. In the diabetic group, AM levels correlated significantly with sialic acid (r=.16; P<.05), but a more significant correlation was found with fibrinogen (r=.30; P<.001). No correlation was found with the other parameters studied. In summary, plasma total AM levels seem to correlate with inflammatory markers but not with endothelial dysfunction markers in Type 1 diabetic patients without atherosclerotic disease. Adeghate El. Mol Cell Biochem. 2004 Jun;261(1-2):187-91. Diabetes mellitus is one of the most common chronic diseases affecting millions of people worldwide. Cardiovascular complication including myocardial infarction is one of the major causes of death in diabetic patients. Diabetes mellitus induces abnormal pathological findings including cell hypertrophy, neuropathy, interstitial fibrosis, myocytolysis and apoptosis and lipid deposits in the heart. In addition, the cytoplasmic organelles of cardiomyocytes including the plasma membrane, mitochondrion and sarcoplasmic reticulum are also impaired in both type I and type II diabetes. Hyperglycaemia is a major aetiological factor in the development of diabetic cardiomyopathy in patients suffering from diabetes. Hyperglycaemia promotes the production of reactive oxygen (ROS) and nitrogen species (RNS). 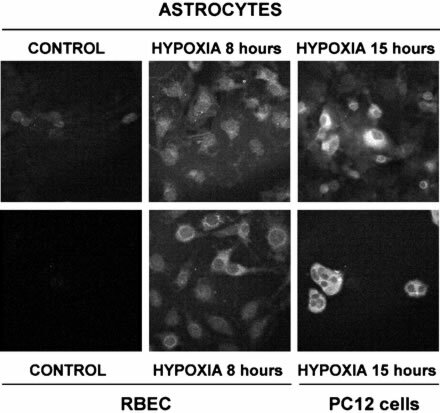 The release of ROS and RNS induces oxidative stress leading to abnormal gene expression, faulty signal transduction and apoptosis of cardiomyocytes. Hyperglycaemia also induces apoptosis by p53 and the activation of the cytochrome c-activated caspase-3 pathway. Stimulation of connective tissue growth factor and the formation of advanced glycation end products in extracellular matrix proteins induces collagen cross-linking and contribute to the fibrosis observed in the interstitium of the heart of diabetic subjects. In terms of signal transduction, defects in intracellular Ca2+ signalling due to alteration of expression and function of proteins that regulate intracellular Ca2+ also occur in diabetes. All of these abnormalities result in gross dysfunction of the heart. Beta-adrenoreceptor antagonists, ACE inhibitors, endothelin-receptor antagonist (Bonestan), adrenomedullin, hormones (insulin, IGF-1) and antioxidants (magniferin, metallothionein, vitamins C and E) reduce interstitial fibrosis and improve cardiac function in diabetic cardiomyopathy. Watanabe et al. Pediatr Cardiol. 2003 Nov-Dec;24(6):559-65. Epub 2003 Sep 4. To investigate the pathophysiological role of two forms of adrenomedullin (AM), a mature AM (AM-m) and a glycine-extended AM (AM-Gly), in congenital heart disease, we measured plasma levels of AM in patients with cyanotic heart disease, high pulmonary blood flow without pulmonary hypertension (PH), high pulmonary blood flow with PH, Fontan procedure, intracardiac repair without complication, and intracardiac repair with PH and control subjects. Plasma AM-m and AM-Gly were increased only for cyanotic heart disease (2.5 +/- 1.3 pmol/L, p < 0.001; 13.1 +/- 6.2 pmol/L, p < 0.05) and intracardiac repair with PH (2.3 +/- 1.5 pmol/L, p < 0.01; 13.0 +/- 7.0 pmol/L, p < 0.05) compared with control (1.0 +/- 1.4 and 8.6 +/- 1.3 pmol/L, respectively). They were similarly correlated with mean systemic arterial pressure (r = -0.40 and -0.37 respectively; p < 0.001), mixed venous oxygen saturation (r = -0.60 and -0.50; p < 0.0001), systemic arterial oxygen saturation (SA(sat)) (r = -0.56 and -0.46; p < 0.0001), and pulmonary arterial resistance (Rp) (r = 0.41 and 0.38; p < 0.005). Multiple regression analysis revealed that SA(sat) and Rp were independently correlated with AM. Interestingly, the venous AM-m level was significantly higher than the arterial AM-m, suggesting that the mature form is extracted in pulmonary circulation, whereas there were no venoarterial differences in AM-Gly. These results suggest that plasma AM-m and AM-Gly are similarly regulated and the main clearance site of AM-m is the lung in patients with congenital heart disease. Katsuki et al. Diabetes Care. 2003 May;26(5):1642-3. Both plasma levels of 8-epi-PGF2 and AM were significantly increased in hypertensive patients with type 2 diabetes compared with normal subjects (8-epi-PGF2 48.6 ± 8.6 vs. 11.9 ± 1.3 pg/ml, P < 0.05; AM 14.8 ± 0.7 vs. 12.4 ± 0.2 fmol/ml, P < 0.02). The plasma levels of 8-epi-PGF2 were proportionally correlated with AM (r = 0.696, P < 0.01) in only hypertensive patients with type 2 diabetes. Significant positive correlations were observed between plasma levels of 8-epi-PGF2 (r = 0.540, P < 0.05) or AM (r = 0.875, P < 0.001) and systolic blood pressure in patients with type 2 diabetes. In conclusion, there was a significant positive correlation between increased oxidative stress and elevated plasma levels of AM in hypertensive patients with type 2 diabetes. Enhanced oxidative stress may regulate the plasma levels of AM in hypertensive patients with type 2 diabetes. Experimental studies have demonstrated that adrenomedullin (AM) has a positive inotropic action and exerts inhibitory effects against ventricular remodelling as an autocrine and paracrine factor. 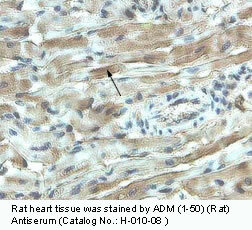 However, there is no clinical evidence for AM acting as a local regulator in the human heart. We measured the levels of various molecular forms of AM, i.e. an active form of mature AM (AM-m), an intermediate inactive form of glycine-extended AM (AM-Gly) and total AM (AM-T=AM-m+AM-Gly), in plasma and pericardial fluid using our newly developed immunoradiometric assay in consecutive 67 patients undergoing coronary artery bypass graft surgery. Pericardial fluid and plasma cAMP, atrial natriuretic peptide and brain natriuretic peptide levels were also measured. The relationships between pericardial fluid AM levels and ventricular functions and other hormone levels were analysed. The level of each molecular form of AM in pericardial fluid was closely correlated with that of the other molecular forms of AM in the fluid. However, levels were not correlated with those in plasma. AM-T levels were slightly higher in pericardial fluid than in plasma (+72%; P<0.05), whereas AM-m levels and AM-m/AM-T ratios were markedly higher in pericardial fluid than in plasma (AM-m, +994%; AM-m/AM-T ratio, +443%; both P<0.01). AM-m, AM-Gly and AM-T levels in pericardial fluid were correlated with indices of left ventricular function, and with atrial natriuretic peptide and brain natriuretic peptide levels. Interestingly, AM and cAMP levels were positively correlated in plasma, but negatively correlated in pericardial fluid. In addition, AM-m, AM-Gly and AM-T levels in pericardial fluid were higher in patients with acute coronary syndrome than in those with stable ischaemic heart disease (AM-m, +80%; AM-Gly, +96%; AM-T, +83%; all P<0.01). These results suggest that AM in pericardial fluid reflects cardiac synthesis, and that enhanced cardiac secretion of AM is associated with left ventricular dysfunction, ventricular overload and myocardial ischaemia. Considering that AM has positive inotropic, coronary vasodilatory and anti-remodelling actions, increased cardiac AM may play a compensatory role in the ischaemic and failing myocardium. Two molecular forms of plasma adrenomedullin during tilt test in healthy subjects. Nishikimi et al. Peptides. 2001 Nov;22(11):1867-72. There is accumulating evidence suggesting that adrenomedullin (AM) may participate in the regulation of circulatory homeostasis and pathophysiology of cardiovascular disease. A recent study revealed that two molecular forms of AM, an active form of mature AM (AM-m) and an intermediate inactive form of glycine-extended AM (AM-Gly), circulate in human plasma. The object of the present study was to evaluate the effect of orthostasis on a time course of two molecular forms of plasma AM and to compare them with the behavior of other vasoactive hormones. Twelve healthy male volunteers were studied. The experimental protocol consisted of 20 min of supine rest, tilting at 70 degrees for 20 min, and then 20 min of supine rest. Blood pressure and heart rate were measured every minute. Blood samples were obtained before, at 2 and 18 min during the tilt test, and 2 and 18 min after the test for the measurements of vasoacting hormones and hematocrit. Blood pressure and heart rate were slightly increased earlier during tilting and then remained elevated until the end of the test. The increase in heart rate and blood pressure returned to normal levels early after the tilt test. Plasma epinephrine and norepinephrine significantly increased during the tilt test. These hormones returned to normal levels 18 min after the test. The plasma renin activity, antidiuretic hormone and dopamine were also increased by the end of the tilt test, whereas plasma atrial natriuretic peptide was significantly decreased after the tilt test. Hematocrit increased slightly in the early phase of the tilt test and was further increased by the end of the test. In contrast, plasma AM-Gly or AM-m did not change during the tilt test or the recovery period. Nitric oxide metabolites did not change, either. There were no significant relationships between plasma catecholamines and AM. Plasma brain natriuretic peptide did not change during the tilt test or the recovery period, either. These results suggest that the two molecular forms of AM, AM-m and AM-Gly in plasma, did not respond to the short term tilting stress. These findings may support the hypothesis that plasma AM is secreted in a constitutive manner from the vascular wall. 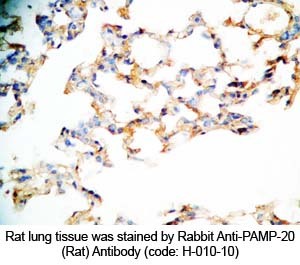 Immunocytochemistry-- Rabbit anti-rat ADM antibodies were from Phoenix Pharmaceuticals Inc. and were used at a 1/200 dilution. After fixation with 4% paraformaldehyde, cells were permeabilized with 0.2% Triton X-100 (v/v). Nonspecific binding sites were saturated using 4% normal goat serum (v/v). 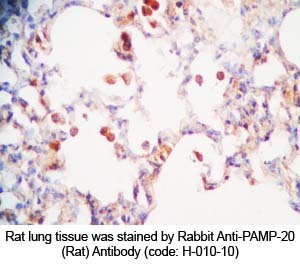 Anti-ADM antibodies were detected with a goat anti-rabbit antibody coupled to rhodamine (TRITC) (Jackson Immunoresearch). After incubation for the indicated time, the culture medium was removed and immediately acidified with acetic acid (final concentration, 1 mol/L), heated at 100°C for 10 minutes to inactivate intrinsic protease, and stored at -20°C until assay. Culture medium (1 mL) was extracted on C-18 Bond Elute cartridges and eluted with 75% methanol containing 1% trifluoroacetic acid. 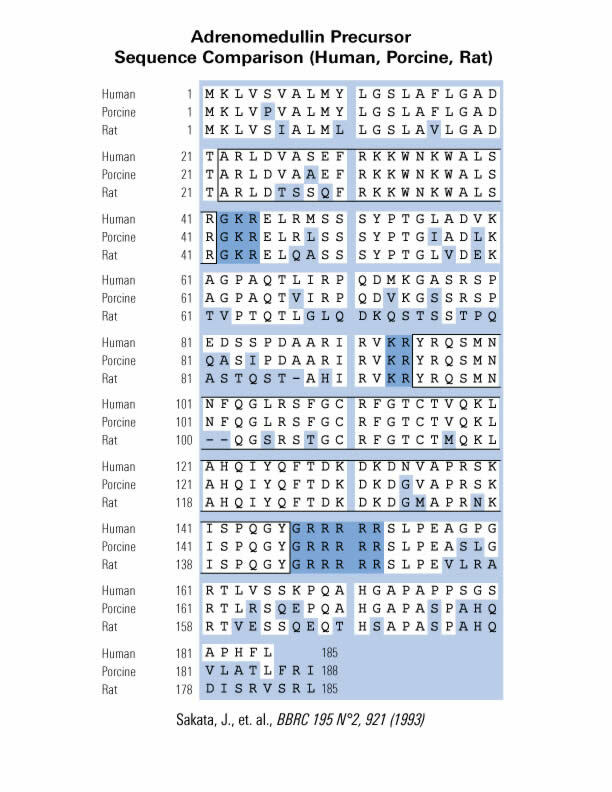 Concentrated eluates were then assayed using a specific and sensitive radioimmunoassay for ADM(1-52) (Phoenix Pharmaceuticals Inc) as previously described. 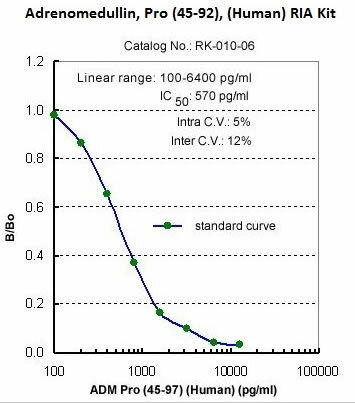 Minimal detectable concentration for the assay is 1 pg per tube, and the half-maximal inhibition dose of radioiodinated ligand binding by ADM is 20 pg per tube. Recovery is 72%, and intra-assay and interassay variations are 10% and 12%, respectively. 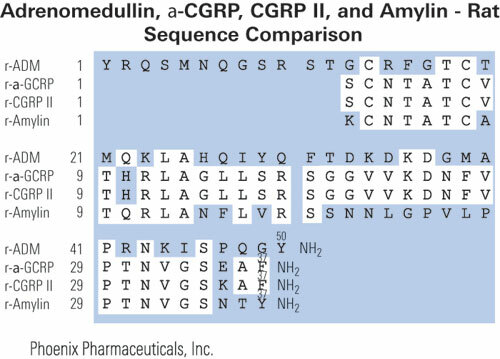 Adrenomedullin 5 (AM5) is a new member of the calcitonin gene-related peptide (CGRP) family identified in teleost fish. Although its presence was suggested in the genome database of mammals, molecular identity and biological function of AM5 have not been examined yet. 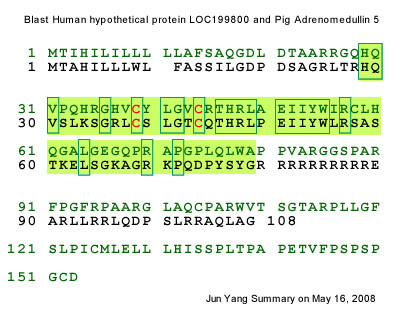 In this study, we cloned a cDNA encoding AM5 in the pig and examined its cardiovascular and renal effects. Putative mature AM5 was localized in the middle of prohormone and had potential signals for intermolecular ring formation and C-terminal amidation. The AM5 gene was expressed most abundantly in the spleen and thymus. Several AM5 genes were newly identified in the database of mammals, which revealed that the AM5 gene exists in primates, carnivores, and undulates but could not be identified in rodents. In primates, nucleotide deletion occurred in the mature AM5 sequence in anthropoids (human and chimp) during transition from the rhesus monkey. 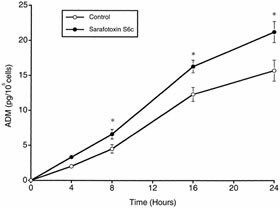 Synthetic mature AM5 injected intravenously into rats induced dose-dependent decreases in arterial pressure at 0.1-1 nmol/kg without apparent changes in heart rate. The decrease was maximal in 1 min and AM5 was approximately half as potent as AM. AM5 did not cause significant changes in urine flow and urine Na+ concentration at any dose. In contrast to the peripheral vasodepressor action, AM5 injected into the cerebral ventricle dose-dependently increased arterial pressure and heart rate at 0.1-1 nmol. The increase reached maximum more quickly after AM5 (5 min) than AM (15-20 min). AM5 added to the culture cells expressing calcitonin receptor-like receptor (CLR) or calcitonin receptor (CTR) together with one of the receptor activity-modifying proteins (RAMPs), the combination of which forms major receptors for the CGRP family, did not induce appreciable increases in cAMP production in any combination, although AM increased it at 10(-)(10)-10(-)(9) M when added to the CLR and RAMP2/3 combination. These data indicate that AM5 seems to act on as yet unknown receptor(s) for AM5, other than CLR/CTR+RAMP, to exert central and peripheral cardiovascular actions in mammals. Takei et al. J Endocrinol. 2008 May;197(2):391-400. For every force there is an opposing force that balances the overall effect. Such is the basic tenant of Yin and Yang. Adrenomedullin (ADM) eloquently fits this ancient wisdom. Hypotensive effects are elicited by fragments of ADM retaining the C-terminal with ring structure. Hypertensive effects are seen with N-terminal ADM fragments containing the ring structure, or with the ring structure alone. The hypotensive effects can be antagonized with C-terminal fragments lacking the ring structure. Nature has endowed ADM with the ability to regulate itself, however it remains to be seen if the Yin and Yang of ADM is utilized in vivo.